Mirro pressure canners are constructed of polished, heavy aluminum, which provides fast and even heating. Canners love Mirro's weighted pressure gauge because it allows canners to can food with confidence and ease. Instead of having to watch a dial gauge, with the weighted gauge, you can simply listen for the jiggling sign of the canner and know that your food is being processed at the correct pressure setting. In addition, the Mirro pressure canner features an overpressure release valve to protect against an unsafe build up of pressure. As an added safety measure, the canner lid locks to prevent opening when the canner is under pressure. 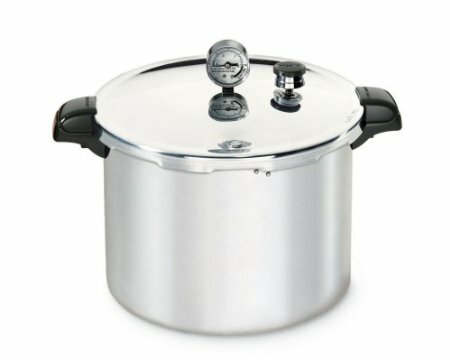 You will love the Mirro pressure canner; it is a highly effective canner with an attractive price.